Remarkable, isn’t it? 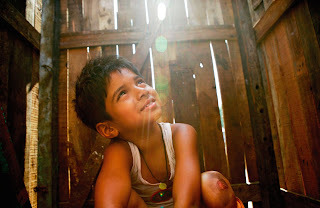 I mean, talk about a critical sleeper – Danny Boyle’s genuinely harrowing, touching and life-affirming story about rites of passage, undying love and a 20 million rupee jackpot scooped Best Picture, Best Director and Best Adapted Screenplay at this year’s Oscars – Slumdog Millionaire (based on the novel Q&A by Vikas Swarup) also won Best Film, Best Director, Best Screenplay (for Simon Beaufoy) and Best Score (A.R. Rahman) at the Golden Globes on 11 January, as well as Best Film and Best Director at the 2009 BAFTA awards. So, what’s the big fuss? Well, the story concerns young man Jamal Malik (Dev Patel), who’s on the brink of becoming the first 20 million rupee winner of the Hindi version of Who Wants to Be a Millionaire? But there are those dead set against him, led by host Prem Kumar (Anil Kapoor), who are convinced that he is a cheat, and have him arrested before he has a chance to answer the big question. How, they wonder, can a poor, uneducated kid from the slums get further in a show that has already defeated professors, doctors and lawyers? As viewers, we learn how over the course of the film – and, as the answers are the answer, it would be unfair to go into detail here. Suffice to say that director Danny Boyle (whose previous film was the really rather rubbish Sunshine (2007), and on which this is a great improvement) and his Indian co-director Loveleen Tandan ingeniously unfold the revelation in a way that is cerebrally, viscerally and visually dazzling. Really – you can believe the hype. 120 mins. In English, Hindi and Urdu.